What does consensus look like? Does everyone have to agree? 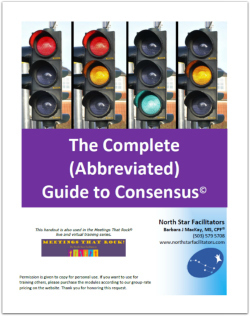 The purpose of building consensus is to help groups to: 1) gain agreement on reaching a decision or 2) resolve an issue where there appears to be many differing and confusing perspectives. Done well, consensus helps you generate tremendous momentum and trust in the group and with you. Done poorly, it can derail a group, leave them discouraged and leave them feeling you are unskilled and untrustworthy. This module helps you deeply explore and understand what consensus should look and feel like, teach you 5 tools and give you practice exercises to ensure you build your competency in this area. We have an extensive FAQ section and a fabulous personal practice exercise. 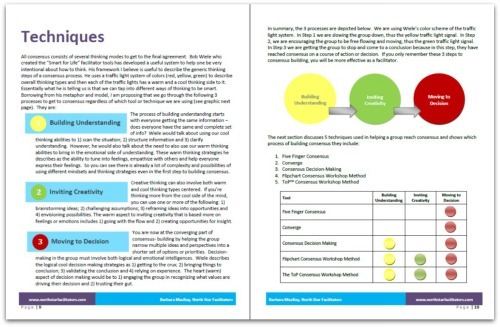 This handout will teach you 5 tools to apply in a variety of situations and give you practice exercises to ensure you build your competency in this area.